I love 3D animated movies. I'll even watch the bad ones, just so I can see what the digital wizards at these animation studios have come up with now. Luckily for me, I have seen more good ones than bad ones, with some of the really good ones even good enough to make it in my list of favorite movies of all time. Like many other people, I love the Pixar movies the most. My top ten is stuffed with their movies, and if they would have made a few more already, this would probably have been an all-Pixar list. 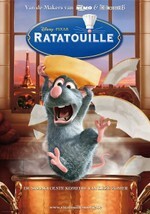 Which isn't to say other studios cannot make a good 3D animated movie. On the contrary! What on earth am I going to put in my movie top 10 for 2007? The end of the year is a time when I always get an itch to make Top 10's. My favorite list to make has always been the list of my 10 favorite movies of the year, but this year it's not something I'm looking forward to that much. I can easily make a list of my favorite rap albums, since I have heard many great ones this past year. Same goes for the list of favorite games. Favorite books. Heck, I might even be able to make a top ten of favorite comics I've read! But movies? Nowadays filmmakers are getting better at making superhero movies. They never really make a superhero movie anymore that is so bad that you almost want to throw away the comic books that the movie was based on, and that you loved so much, just because you have just seen your favorite characters dragged through the mud on the big screen, their origin stories ruined and misinterpreted, with new elements added that come out of nowhere, just because the filmmakers thought it would make the movie more accessible. But back in the days there have been some real stinkers, and I wondered which superhero movies you, my readers, hated most. And here is the top ten, with a few unexpected surprises, like the fact that enough of you even saw the movie in the first position to make it end that high. May was a pretty amazing month for the movies. Three threequels, Spider-Man 3, Shrek the Third and Pirates of the Caribbean: At World's End made for one of the most profitable months in movie history, breaking records left and right, more or less sealing up the race for this summer's box office champ between the three of them. When it comes to the quality of the movies, however, it's a whole different story. While all three movies had prequels that excelled not just in box office, but also in quality, it seemed that for the parts three, the filmmakers didn't feel like pushing themselves anymore. While I haven't seen the third Shrek or Pirates yet, their reviews and user comments speak for themselves (though Pirates is still doing pretty well on the IMDB). And Spider-Man 3 was just very disappointing, fun but empty emotionally, and packed with too many characters battling for the crowd's attention. But: there is a new month coming, with one big threequel, some sequels and even a movie series getting ready for it's fourth installment. Which of these should you definitely try to see? For some reason, the pirate movie has never been as profilic as, say, war movies, or movies with knights, or even movies about racing. Which is kind of weird, since it's one of the big childhood fantasies (at least for little boys), to one day be a pirate! It's not for nothing that Johnny Depp immediately agreed to star in the first Pirates of the Caribbean movie, as soon as he heard the words 'we want you in our pirate movie'. But if you ask people for their five favorite pirate movies, they will probably be able to name two or three, and then be stumped. Maybe it has to do with the fact that so many people have such vivid childhood dreams of being a pirate, that any movie about the subject could only be a disappointment. Or maybe it's the fact that in most pirate movies that were released, they are not much more than a stereotype, drinking rum and running around with their eye patches and their stripey shirts. Still, dig a bit deeper in movie history, and you'll be able to find some true gems. Yes, we all know that Spider-Man 3 probably has the highest budget for any movie ever made. But when you adjust the highest movie budgets for inflation, Spider-Man 3 only comes in third place. And what do you know: the most expensive movie ever made, adjusted for inflation, isn't even American! An opening day is a very important for any movie out there. With it's opening day, a movie can show how strong it's box office outcome looks. Has all the hype lead to ticket sales? Is the audience relying on bad reviews and ignoring your movie? Does it already look like your 200 million dollar investment is not going to make it's money back? Especially in days like this, when some of the biggest movies of the year open, an opening day is a good indication of whether or not a movie has a chance to break records. Spider-Man 3 broke the opening day record when it was released two weekends ago, and went on to break the opening weekend record as well. There are two or three other movies this summer season that might have a shot at these records. There's Pirates, there's Transformers, and of course there's Shrek the Third.